Let's light up the dark with a custom made reflex! A couple of days ago was the day when most airline tickets are booked from Sweden to warmer countires. No wonder that that day happen to be in mid-January. We don't really have an abundance of light this time of year in Sweden and the absence of daylight can affect anyone. For just that reason, the week's blog post feels extra fun! Whether you were one of those who booked a trip or not, a little extra light in the dark may come in handy for a couple of more weeks. 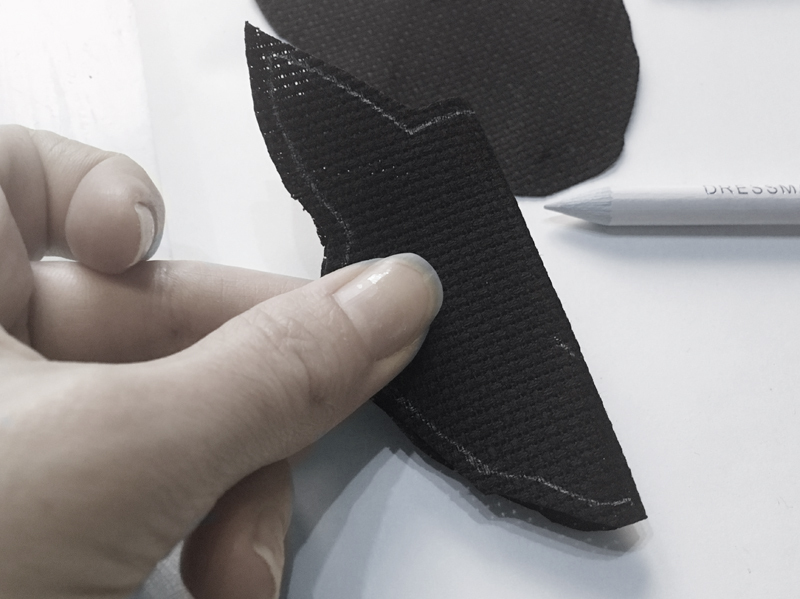 So in this post I will go through the process of creating an embroidered reflex! A reflex does more than reflect the light, it can also reflect you and your personality, and of course it's, as always, fun to embroider. I started by sketching some simple shapes on a paper to get an idea of ​​how large my reflex will be and what motive I want to use. Think freely and in simple silhouettes. As you can see, I chose number one. 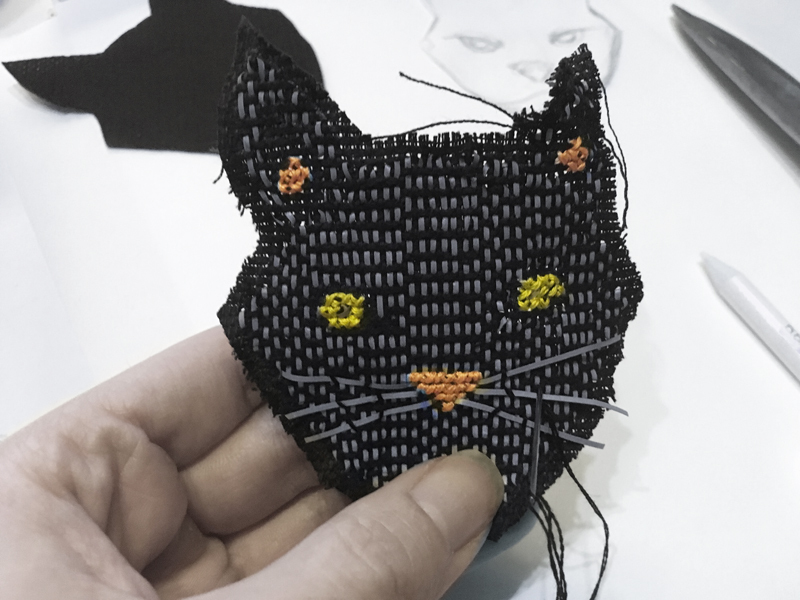 In this example I have chosen to try sewing on black aida fabric. 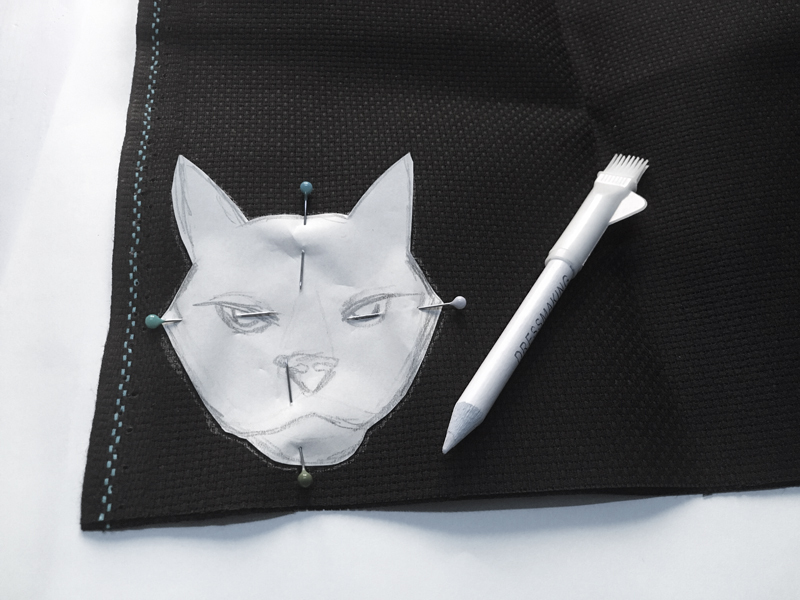 I fasten the cat head on the fabric and mark the outlines of the paper piece with a marker pen. 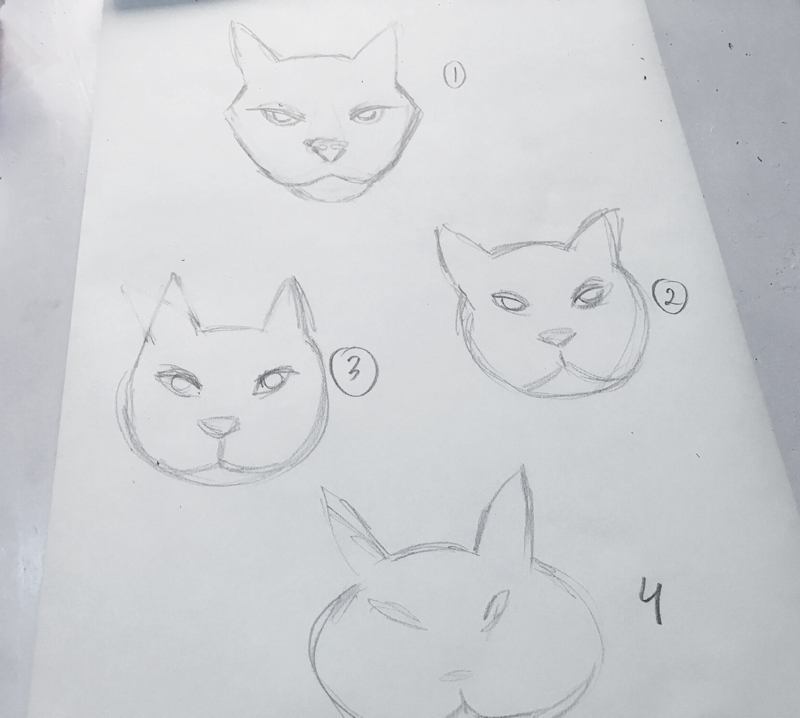 In order to draw the outline of the cat's nose in the center, I folded the fabric in the middle to mark the spot. Note, I made the mistake of cutting the cat shape of the weave. 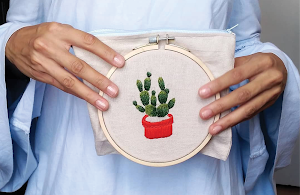 In order to avoid hard and hard edges, I recommend that you leave the painted object on the fabric and use an embroidery hoop until it's fully embroidered. The reflector thread is flat and not elastic. 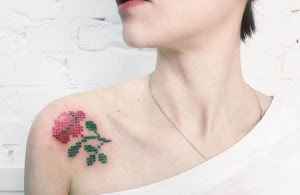 To use cross stitch, which was my initial idea, proved to be very difficult. 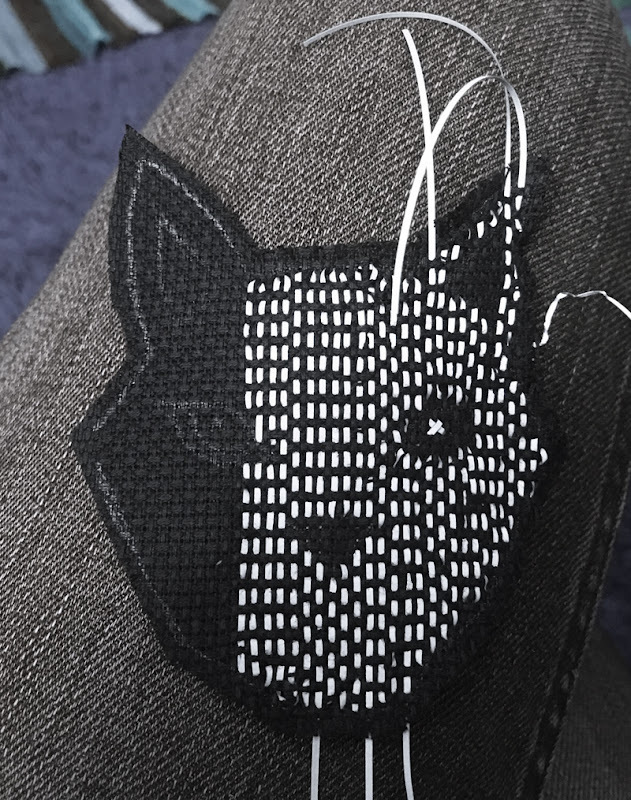 Instead, I tried to "weave" the reflection thread through the fabric and leave blank spaces in the areas where I would later embroider with plain thread for details. To fix the cat's whiskers I attached the reflection thread behind the cat's nose and pulled through the threads one whisker at a time. Since too long threads tend to break, I chose to attach the whiskers with simple stitches. For the back of the reflex I cut a piece of felt and added another piece of aida fabric before I sew them all together. 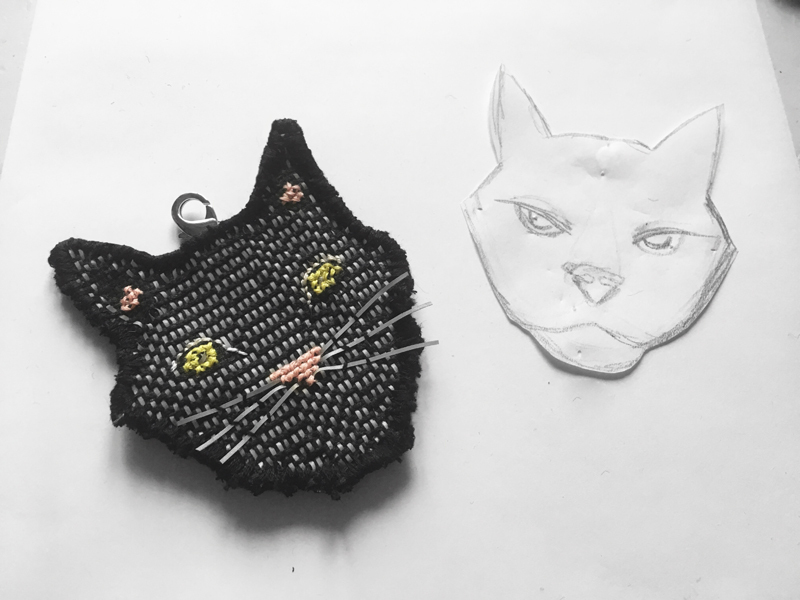 To try to get rid of most of rough edges, I have sewn together the front and back by embroidering tight stitches around the head of the cat. Of course, you can use any fabric to the back than the fabric you selected as the background for your embroidery. Paint the subject on the fabric, use the sewing thread and do not cut the subject until you embroidered completely. Preferably use embroidery fabric or regular fabric. Keep in mind that round shapes in your subject make it easier to sew up front and back. The reflection thread is more compliant if you combine it with another thread (which I learned from a different one). 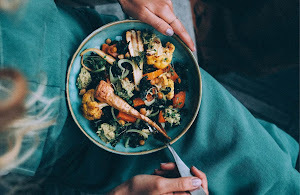 With these tips, I think you're ready to start. I hope I've been able to inspire you to give yourself the chance to design your own reflexes and to play around with your own designs and materials. Now I'm going out with the dog to light up the block with all my reflexes!